If you’re like me, those hours will only be spread over a few days; if I didn’t have a toddler at home with me, this would have been a long, lazy, one-afternoon read for sure. The book opens with the perfectly ordinary, day-to-day life of Jacob Portman, a teenager whose close relationship with his grandfather is central to this well-written story. When Jacob was a young boy, Grandfather Abraham shared incredible tales of his own childhood, peppering them with old black and white photographs of children doing strange things like playing with a ball of fire or who were otherwise, well, peculiar-looking. Of course as Jacob grew older, he viewed the photographs and the tales from a more mature perspective, no longer blindly believing his beloved grandfather’s words. But when Abraham delivered a cryptic message and Jacob saw a strange sight of his own, Jacob’s ho-hum days became a distant memory. Armed with knowledge no one else in his family had, Jacob felt constrained to investigate his grandfather’s past across the pond — at the site of Miss Peregrine’s Home for Peculiar Children, an abandoned orphanage perfectly placed by Riggs on a secluded Welsh island with just one public phone, no cell service, and more secrets than Jacob could have ever imagined. It’s difficult to write too much more about the plot without giving anything away — and believe me, you will want to play along and try to figure out the mysteries of this book for yourself. I wouldn’t say it’s appropriate for the younger readers on the usual YA level for various reasons — some language, yes, but mostly just the overall freaky factor. I am guessing some adults may have had nightmares after reading this. So let’s say it’s certainly an adventure book mixed with fantasy, and well, it’s just downright clever. Which leads me to the photographs. I’m a sucker for old photographs anyway, but the way Riggs pulled the amazing vintage images of “peculiar children” into the story was exceptional. He does a great job of describing the photos, but when you turn the page and actually see the eyes staring back at you (or not! You’ll see!)? This technique added a wonderful dimension to the story. 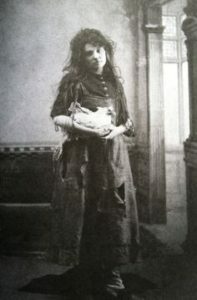 The photos, by the way, were either collected by Riggs himself or borrowed from others who must have rummaged through thousands upon thousands of bins at estate sales and flea markets and such to salvage these treasures. Just the fact that the pictures have now been preserved for future generations makes this book concept a winner for me. Fair warning, however: If the cover photo creeps you out, you should probably not read this one in the dark. In any event, I can say with confidence that the twists and turns in Riggs’ amazing and yes, oh-so-peculiar world kept me flipping pages, stealing moments throughout the day to peek in on what was happening with Jacob. This book is the first in a series, and I’m already reading the sequel, Hollow City. Overall, if you like books that are a little off-the-wall (this was published by Quirk Books, after all! 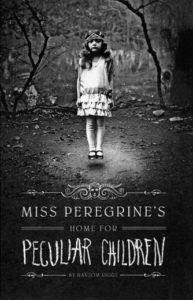 ), slightly creepy, and transport you to a whole other world, give Miss Peregrine’s Home for Peculiar Children a go. And do it before you see the movie! You know the book is always better. DISCLAIMER: In exchange for an honest review, I received a review copy of this book from SocialBookCo, a book price comparison site that aims to bring together book lovers to enjoy reading the books they love. Links to the book in this post lead to SocialBookCo to help you find the best price; I receive a small referral fee based on sales through this link.